When you are a parent to a child or a legal guardian to a minor, it is important to be aware that your consent is critical to any form of decision-making that involves them. Consent is the act of giving an affirmative reply to a process or an action; it is authorizing someone to do something to someone else. Not everyone is entitled to provide consent, though. For one, a person who is qualified to provide it should be mentally healthy and is of a sufficient age in order for consent to be fully enforced. A consent that is used accordingly can always come in handy especially in cases of medical needs, government processes, traveling of minors and any other instances where there is an actual need for one. This will also allow you to be aware of the requirements and guidelines of schools, government offices, hospitals and other organizations or institutions about the usage of the specified document. Consent can be given in verbal or in written form. However, putting things into writing is the best way to provide physical evidence that authorization was indeed given by the people in charge. A written form of consent will also hold more water in court compared to a verbal consent. 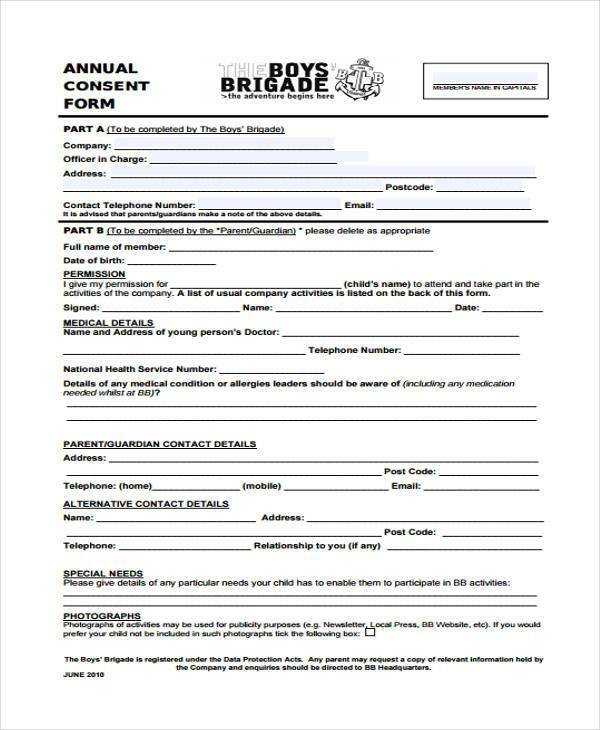 You can download our varied types of consent forms available in Doc format. Our wide array of sample consent form templates range from medical consent forms to surgical consent forms and parental consent forms. In a world where everyone is out to protect themselves, obtaining a consent form prior to conducting any type of procedure helps to protect everyone’s interest and to ascertain that you have the right and proper documents to use as a reference in times of disputes. A signed consent form will indicate that the person voluntarily gave permission based on correct and necessary procedures. This type of consent is one that is clearly stated verbally or non-verbally. A non-expressed consent can be given with a mere shake of a head or a nod. It is important to note, however, that a non-verbal expression of consent will not hold much water in court and can be easily disputed as compared to a written consent. Patients will be more aware of the medical procedures that they will undergo. Patients will be informed about the risks of undergoing a particular procedure. Patients can identify the benefits and advantages that they may experience and have after the operation. Patients can have more idea about the procedure or treatment which will allow them to calm down and identify the next step that they need to be ready about. Using an informed consent signifies that a patient has agreed to all the terms and conditions presented by a medical institution. However, there are cases where patients decide to withdraw from the treatment in the middle of its procedures. Again, health hazards and the effects of stopping should first be specified and another form needs to be filled-up to state and record the decision of the patient. Consent that is implied is consent that is developed based on a person’s actions or on a circumstance. This type of consent is usually related to rules and regulations such as when a driver is driving under the influence. Under the US law, driving licenses include a consent clause that allows the police to conduct field sobriety tests to determine if a driver is intoxicated and to disallow him from cruising the streets if he is. A unanimous consent is a general consent that is used by a particular group or organization. This kind of consent is given to various parties and entities especially to those whose functions are relevant to parliamentary processes and procedures. Unanimous consent can also be used in activities in the senate. If a person whose decision is needed for a particular transaction or process cannot be provided due to the inability or incapacity of an individual, then a substituted consent may be necessary. A substituted consent allows another person to be in charge of the decisions for an individual in a legal manner. This means that he/she has the authority to decide in behalf of the person who is incapable of providing an objective and sound decision for himself/herself. An example of the usage of a substituted content is when a child is going to travel with a guardian. If something happens to the kid, a Child Medical Consent or a substituted consent is needed to be presented before a medical institution can allow the guardian to decide for the child’s medication or operation. Providing consent is a serious and legal matter. One should make sure that the consent is written in order for it to be enforceable in the court of law. The Consent Forms we provide cater to the different types of consent forms that you need, such as Business Consent Forms and Medical Consent Forms. Our sample forms are easy to download and can be easily accessed with the click of a button. Informed Consent is the process of getting legal permission from a person or a patient before conducting a healthcare intervention or a plan of treatment. Informed consent is collected based on guidelines from the fields of medical and research ethics and should only be given right after the subject of medical scrutiny has been properly informed about the benefits, the implications, and the risks of having to undergo such procedure such as when a patient needs to go through chemotherapy. Chemotherapy is a common treatment plan for patients with cancer; however, chemotherapy also has some downsides that could lead to potential health risks such as damage to lung tissue, heart complications, infertility, kidney failure, and a risk of a second cancer. A patient always has the right for his/her health. This is the reason why he/she should be the one to select whether the operation shall be continued or not. More so, only a limited time will be given to the patient and his/her family to decide as time duration can actually affect the possible outcome of an operation. Traveling can be a fun and adventurous experience for children. However, with the rapid increase of cases regarding child abduction and human trafficking, authorities have been very stringent about implementing rules relating to travel where children are involved. If you are traveling with a child who has medical conditions or even just in the case that you are acting as his/her legal guardian, having a child travel consent form on hand is very helpful. This document will allow you to prove that you have the authority to decide for the child and that you are responsible to take good care of him/her within the entirety of the trip. A Travel Consent Form shall be notarized for full and effective usage. Child Travel Consent Forms are measures provided by the government to make sure that a child is safe from predators who are lurking behind the guise of kin or foe. A Consent Form usually indicates the child’s destination, the duration of the trip, and the parents’ contact details. By serving a Consent Form or a Parental Consent Form, authorities are able to determine if a parent is aware that their kid is travelling and has been given authorization to travel with their friends, relatives, or in custody cases, with the other parent. A Child Medical Consent is the kind of consent that is necessary to be presented by a legal guardian. Given the medical condition and situation where a child is currently in and the chances that a parent or the parents of the child are unreachable due to their location or any other issues, then the legal guardian who has the child medical consent form can decide regarding the child’s medical treatment. When a child is travelling abroad with adults other than her parents, or is somewhere else in the care of a sitter, grandparents, or relatives, it is always a smart and wise move to leave with them a Child Medical Consent to avoid delays in the decision making of your child’s treatment. Be sure to always be prepared for you and your child’s safety. Provide consent forms that are foolproof and have been duly notarized. Download forms from reliable sources. You can choose from our wide array of Sample Consent Forms to download quickly and easily.